Laryngoscope Handle, BritePro Solo, Disposable - FLEXICARE, INC.
BritePro Solo is a complete Single-Use Fiber Optic Laryngoscope Solution comprised of an advanced LED handle and a fully metal blade. BritePro Solo Laryngoscope Handles with Macintosh Blade - FLEXICARE, INC.
BriteBlade Pro Laryngoscope Blades, Miller - FLEXICARE, INC.
BriteBlade Pro is a 100% metal fiber optic blade designed for single patient use. BritePro Solo Laryngoscope Handles with Miller Blade - FLEXICARE, INC.
Laryngoscope Handle, BritePro Solo, Mini, Disposable - FLEXICARE, INC.
BriteBlade Pro Laryngoscope Blades, Macintosh - FLEXICARE, INC. The Curaplex Greenline/D disposable fiber optic laryngoscope blades reduce the cost and time spent cleaning laryngoscope blades for future use. BritePro™, Solo Omni with Pro, Laryngoscope Combos - FLEXICARE, INC.
BritePro™ Omni pre-assembled blade and handle for instant use. Sterile packed, reducing the risk of cross-contamination. BritePro™, Solo Omni with Pro, Miller 2 - FLEXICARE, INC.
BritePro? Omni pre-assembled blade and handle for instant use. Sterile packed, reducing the risk of cross-contamination. Fiber optic disposable laryngoscope handle in a medium size. BriteBlade Pro Laryngoscope Blades, Phillips - FLEXICARE, INC.
BriteBlade Pro is a 100% metal fiber optic blade designed for single patient use, which eliminates the risk of cross-contamination from both the blade and handle. BritePro Solo Mini Laryngoscope Handles, Pro Miller Blades - FLEXICARE, INC. Complete single-use laryngoscope handle with blade developed for neonates and small infants. BritePro Solo Mini is supplied with fitted batteries, so it is always ready for instant use. SunMed SunOne system GreenLine®/D™ LED single-patient-use laryngoscope handle with textured grip, sterile. The GreenLine®/D™ disposable handle is a fully contained unit with batteries included. Ideal for both EMS and routine intubations, there is nothing to install or change. BriteBlade EVO Laryngoscope Blades, Macintosh - FLEXICARE, INC. The integrated fiber optic within the body of the IntegraBlade makes the structure seamless, therefore reducing the risks of contamination or foreign bodies becoming trapped. BritePro Solo Laryngoscope Handle - FLEXICARE, INC. Handle for the BritePro Solo line of laryngoscopes. Low profile for improved visualization and durable construction with 3 ball bearing locking system. BriteBlade Pro Laryngoscope Blades, Wis-Hipple - FLEXICARE, INC.
BritePro Solo Handles with Fiber Optic Macintosh Blades - FLEXICARE, INC.
BritePro Solo features a Single Patient Use handle and LED light source with a fiber optic hybrid metal blade. The blade incorporates a reinforced nylon base and the handle conforms to all standard fiber optic systems. BriteBlade Pro Laryngoscope Blades, Strong Curve, Miller - FLEXICARE, INC.
BriteBlade Pro is a 100% metal single-use fiber optic blade designed for single patient use, which eliminates the risk of cross-contamination from both the blade and handle. 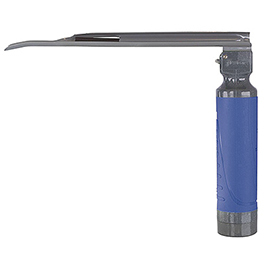 BritePro Solo Laryngoscope Handles with Phillips Blades - FLEXICARE, INC. Complete single-use laryngoscope handle with blade developed for neonates and small infants. BritePro Solo Handles with Fiber Optic Miller Blades - FLEXICARE, INC.
BriteBlade EVO Laryngoscope Blades, Miller - FLEXICARE, INC.
Laryngoscope Handle, BritePro, Fiber Optic, Disposable, Handle Only - FLEXICARE, INC.
BritePro™ is a single patient use fiber optic handle system comprised of disposable handle and a reusable light source utilizing LED technology providing clinicians with complete system. Disposable fiber optic laryngoscope handle in a penlight size. Laryngoscope Blade, BriteBlade EVO, Fiber Optic, Disposable, Miller, Size 1 - FLEXICARE, INC.
BriteBlade Evo is a fibre optic hybrid metal laryngoscope blade with a reinforced nylon base locking system designed for single patient use to fit all green specification handles. Laryngoscope Blades, King Vision - AMBU INC.
Laryngoscope blade, King Vision, standard, disposable. Blade attaches to the King Vision display sold separately. The SunMed Standard /D™ conventional disposable laryngoscope blades solve contamination problems and eliminate the cost and time spent reprocessing blades then returning them for use. Blades are made of surgical stainless steel. Soft matte finish prevents reflection and glare during tissue visualization. BriteBlade Laryngoscope Blades, Macintosh - FLEXICARE, INC.
BriteBlade ™ has a unique and patented hinge design that prevents the folded blade from touching the handle. BriteBlade Laryngoscope Blades, Miller - FLEXICARE, INC.
BritePro Laryngoscope Handles with BriteBlade Pro Blades - FLEXICARE, INC.
BritePro is a Single Patient Use Fiber Optic Handle System, comprised of a single-use handle and a reusable light source, utilizing the latest in LED technology, providing clinicians with a complete system. Laryngoscope Blades, Rusch Lite Slim - TELEFLEX MEDICAL, INC. The Rusch Lite Slim™ disposable laryngoscope blade offers compatibility with your current standard handles. Fits all standard/conventional handles manufactured to ISO 7376 standards. BriteBlade Pro Laryngoscope Blades, Robertshaw - FLEXICARE, INC.
Laryngoscope Blade, Fiber Optic, Stainless Steel, Flip-Tip, Macintosh, Size 3 - PROPPER MFG. CO. INC. The Propper Flip-Tip® blade is a modification of the traditional Macintosh blade designed to improve visualization of the larynx, and can assist in both non-complicated and difficult intubations. Laryngoscope Handle is in standard configuration. The Cranwall® laryngoscope blade is compatible with all conventional laryngoscope systems. The intubation kit includes 9 blades, 2 handles, airways, Endotracheal Tubes, Nasopharyngeal Tubes, forceps, stylette and a carrying case. Laryngoscope Blade, Green Rusch Lite, Fiber Optic, Metal, Miller, Size 0, Premature, 78mm - TELEFLEX MEDICAL, INC. The Green Rusch Lite™ is a single use disposable metal laryngoscope blade. Created with a unique design, giving the user the performance and feel of a reusable metal blade.